In 2011 I completed writing a book on my personal, political and intellectual engagement with Zionism and Israel, which goes back almost five decades. As a teenage socialist in the 1960s Antony Lerman enthusiastically embraced Zionism. In this book he explores how he gradually lost his Zionist ardour and became a leading Jewish critic of Israel’s political direction. Becoming an Israeli citizen in 1970, Lerman lived on a kibbutz and served in the Israeli army. He returned to England in 1972 increasingly troubled by doubts about Israel’s disquieting trajectory. In the 1990s Lerman founded the Institute for Jewish Policy Research and was active at the highest levels of international Jewish political and intellectual life. In charting this journey, he details his ostracism by the Jewish establishment and, as an insider, offers unique insight into the difficulties faced by Jews who choose to speak out against Israeli policies towards the Palestinians. Written with passion and generosity, Lerman’s memoir conveys a message of hope in arguing that a just and peaceful resolution of the Israel-Palestine conflict can be achieved through taking responsibility for the past and being guided by the universal principles of human rights. An honest and moving account of how Antony Lerman – like so many Jewish liberals of his generation – fell in and out of love with the Zionist dream as translated into Israeli reality. A singular figure of principle in the grubby world of communal politics, Lerman retells factually and with a commendable lack of bitterness his shameful treatment at the hands of the British Jewish establishment. 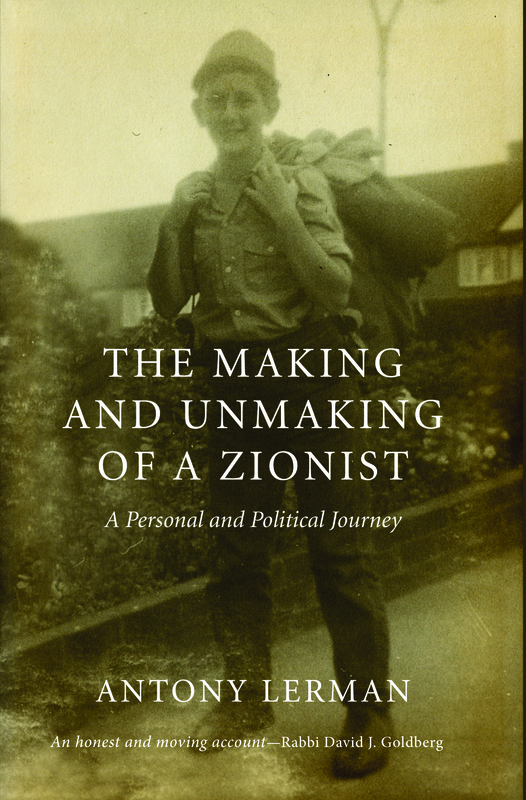 In this very courageous, personal yet intellectual exposé, Antony Lerman, who, unlike many of his peers, refused to cross the red lines into the ideological territory of ethnocentric particularism, explores his journey to and from Zionism. His critique contains sharp insights and the inspiration of an optimistic prophet who believes that peace, justice and human rights are the true Jewish values. Antony Lerman’s journey from fervent Zionist to thoughtful critic of Zionism is fascinating enough. But this rich and compelling account also charts his sustained vilification and shows how extensively bigotry has replaced reason in the Middle East debate. You leave it, however, uplifted by the encounter with a commentator who has wrestled with these difficult questions with seriousness and integrity all his professional life. I do hope you are stimulated enough about the subject matter to order a copy and I look forward to receiving comments and feedback. I decided to buy this book after hearing Antony Lerman talking to Rickie Ross on Radio Scotland this morning (Sunday). I grieve for suffering Palestinians and also Isrealis many of whom are innocent of violence. Weapons cannot be the way to solve this conflict.